A snowstorm on Saturday gave me time to finish some books I had started – snug in my warm house with a blanket, tea/coffee, recliner and books looking out my window overlooking the Allegheny Valley. This is one sweet book – in a genre all of its own, described as – a blend of fiction, allegory and inspiration, seasoned with a dash of autobiography. I think I will be buying one for each of my college-age boys. Great advice in it about keeping the right perspective in life, especially during tough times. The jest of it is – Jones, an older gentleman, shows up in the lives of different people who are struggling. Along with helping them notice the good things around them, he speaks wisdom and hope into their lives that helps them turn their life around. Many of life’s treasures remain hidden from us simply because we never search for them. Often we do not ask the proper questions that might lead us to the answer to all our challenges. We are so caught up in fear and regret, that hope seems a foolish endeavor. Proof of hope, however, is not only possible; it is an overlooked law of the universe. Proof of hope … is it possible? I’ve had some dark days when I would have answered – no, don’t think it’s possible. But now I say – yes, it is! The odd thing about ‘proof of hope’ is there’s no one place, formula, quote or verse that will give us all hope. We each have to find it – in a way that speaks to our unique wiring and the time/place we are at in life. 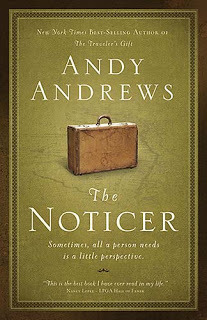 I find hope in some of the same ones mentioned in The Noticer – God’s promises, books, outdoors and being intentional about noticing beauty around me. ← Accepted for Dream Year – Yippee!! I find hope and inspiration in autobiographical books such as Randy Pausch's "The Last Lecture",and Ben Carson's "Gifted Hands" . This book sounds like it would be just up my alley. I also find hope in nature and admiring all the beauty God has created. i actually find a lot of hope from believing bloggers …one of them being you.